sent us a bag of goodies to try and review. In the goodie bag there were 2 whole bags of chewy treats. This stuff rocks...we love it and recommend it. Wanna win your own Cesar goodie bag? Could I have more Cesar stuff yet? Is it time for Cesar stuff yet? Love your version of the logo!!! They should use it! we are in it too! Chicken and cheese yummy. Oh boy, oh girl! Hoooray for Little Cesar food. It's the bestest. 6 dogs here...1 entry. THANKS! Although we are not small (What ARE you talkin about Mommy? I'm a delicate little flower - Meja) we love us some Cesar stuffs!!! That looks delicious. If I were a dog, I would want some for sure! So... you just do what you do and someone SENDS you food to try?!!? How does that work!?!? Woooooo!!!!!!!!! I'm glad you liked it! I think we're too big to qualify for the food, but we hope somebody enjoys it! Definitely should use you two for their logo! You look awesome!! Good luck to all the entrants. I know you won't want to mail it out to the UK and I think it's probably not for greyhounds, like Houndstooth says. You two are so lucky. You always get such great stuff to review. Your treats sure look great. Enjoy. Speaking of foodables, thanks for your concerns over my bigfoot. Momma sent a totally detailed list of everything I consume just to be sure. We just love that picture of the two of you sharing the chicken with cheddar cheese! And we also love your new header picture! Yum.... that sounds wonderful. Even though we're bigger dogs we could eat that on top of our dinner. You are two lucky dogs to have all those goodies. YUMMIES.... I love me some gooooooooood din dins....mmmmhhmmmm IM IN!!! yalll are sure lucky how do you get to reviews all that yummies stuff?? I think you two should be their new spokesdoggies! Wow, that Cesar stuff looks totally delish!! I wanna come over for dinner. BOL BTW: Love your new header pix. We dont eat that food, but it sounds yummy! Wow you 2 get all the good stuff! I gots a tummy problem and can only have certain foods. But you both look like you love it! 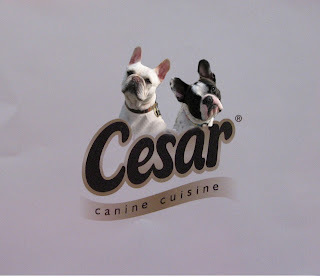 I thinks that Cesar should definately change the logo to your two cute faces though! Thanks for the award, we will post it soon. LUV luv luv your new header pic. YOu two are just way too adorable!! That's so cool! Even though we're not so little, we're totally impressed that companies send you free goodies because of your popularity. We love your t-shirt, too! Heehee! You two are like a couple of professional food critics! Very impressive indeed. : ) Never tried Cesar before...probably because I'm a CAT. But I've watched his show to get tips on how to train Gloman. Chicken and Cheddar...OMD! Do they have a line of chow for big dogs? You two are simply Adorable!!! Please don't include us in the drawing though....you can pop over and see why!! Pick me, Pick me!!!! Looks yummy! Give Big a chance too!